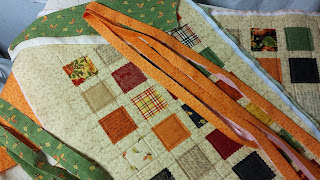 I organized, basted, and quilted both table runners Friday night. I also got the binding strips cut, sewn, and ironed. Just need to square up the runners and then get those bindings sewn on!!! Love FNSI Progress!!! I hope you all got as much as I got done and maybe even MORE!!! 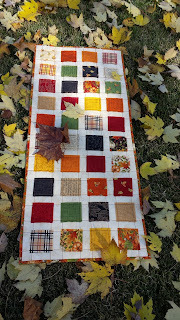 Thank you, Wendy, at Sugarlane Quilts for organizing the fun!! FNSI, Gloves, and Candy Buttons! Happy Thursday! One week until Thanksgiving. I hope you have been busy planning your dinner and getting ready to be with family and/or friends. My daughter arrives Saturday evening from Virginia and I AM EXCITED! Love her so much! Tomorrow night is Friday Night Sew-In and I'm ready! I actually have a couple of pillowcases ready to sew and two table runners marked and ready to complete! My stars! Where has the "real me" gone??? Hahaha! Anyway, don't forget to sign up and have fun tomorrow night. My last check showed 23 of us all set to go! It's a great excuse to have some "ME" time!! Lately, I've been busy knitting up a storm. I finished my gloves for Loopy Academy. They really were not that hard but you do need to pay attention ... OK, so that part was hard! 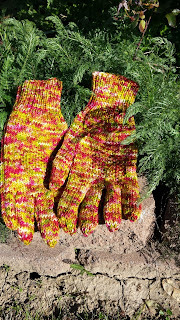 I made them in this really funky color but, trust me on this, they look great with my pink jacket! As for the other two projects for my Junior Year 1st Semester at LA, my socks are done except for the bobbles, which are a requirement. We also have to knit a toy. I've got it picked out but am waiting on yarn to arrive at The Loopy Ewe. They said it would be here in the Fall but I'm starting to wonder if it'll be here in time for me to finish by the December 15th deadline ... I'll post pictures of both when they're done. Of course I couldn't let it rest at that. I joined in on a Laura Aylor Knit-A-Long. Actually it's my 2nd. The first, a mystery shawl, is done with the exception of the outside border. As for the Cowl KAL, we are to knit two of her cowl patterns by November 30 and we'll get a brand new pattern of hers FREE! I've got the first one done except for weaving in the ends and the 2nd one has been started -- barely, but it is started! I'll share pictures of these also when completed! 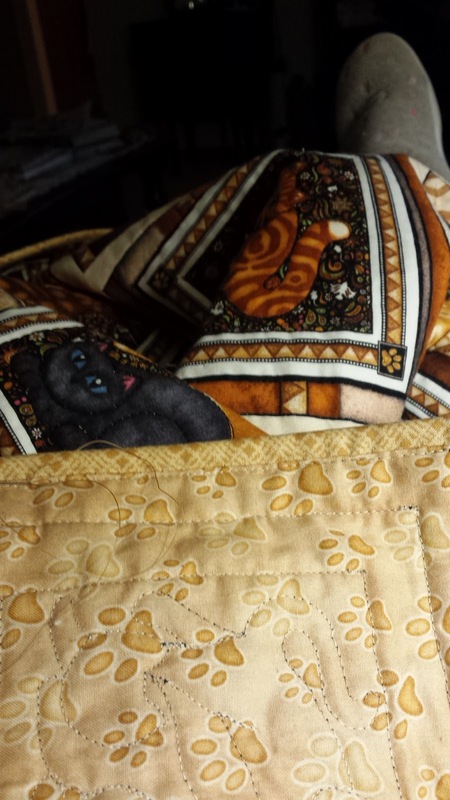 I thought I'd also share a picture of my kitty quilt. Ta! Da! Finished!!! Doesn't it look great draped over my new glider/recliner? 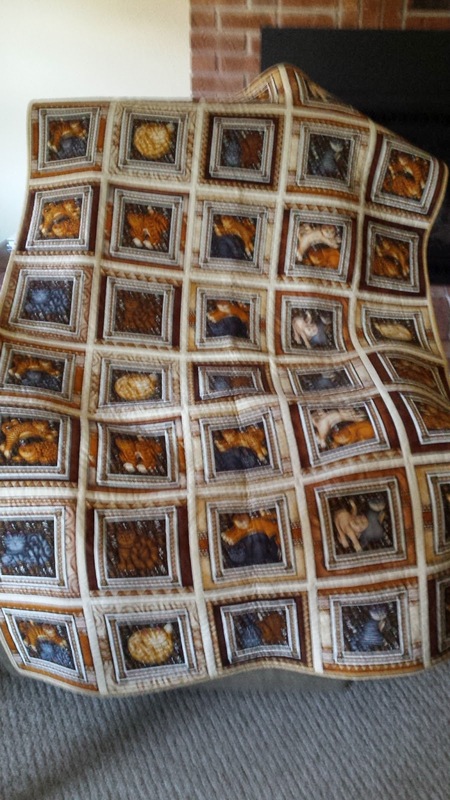 I can't wait to snuggle in it this winter! And, by the way, that's another APQ 2016 UFO Challenge project F.I.N.I.S.H.E.D!!! Woo! Hoo! 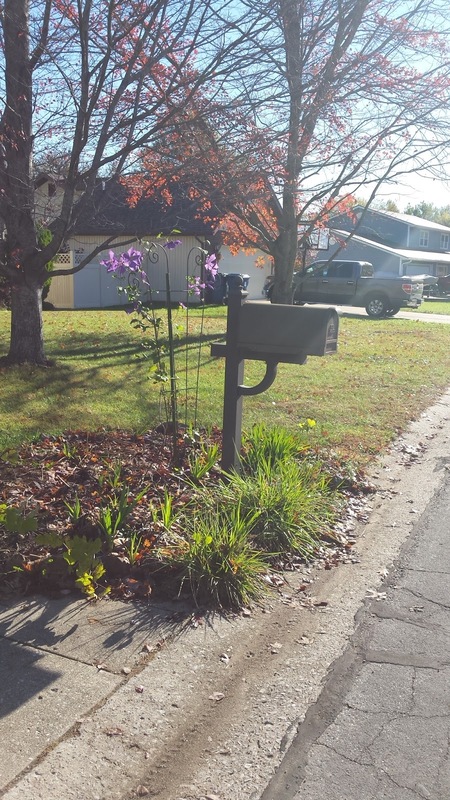 Recently I talked my husband into a beautiful autumn drive to Shelbyville. It takes just under 2 hours to get there but there is a quilt store that was featured in Quilt Sampler magazine that I wanted to check out. 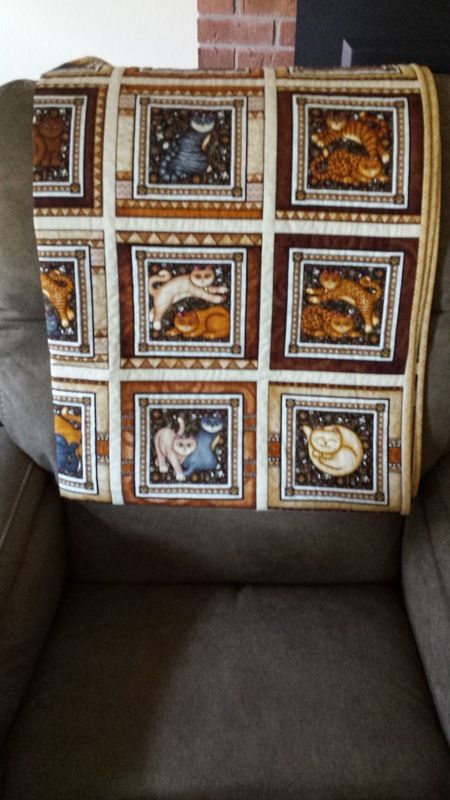 I found an adorable table runner pattern there but I had to buy a kit to get the pattern. I didn't understand that until I got into it -- it's their very own pattern and it's called "Candy Buttons" ... like the old-time dot candies on the paper! Remember those??? 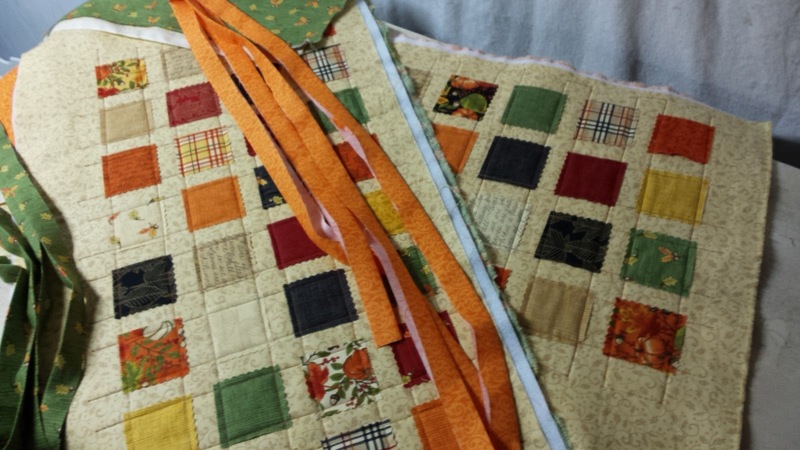 Anyway I stitched mine up lickety-split and loved it so much I'm making four more! 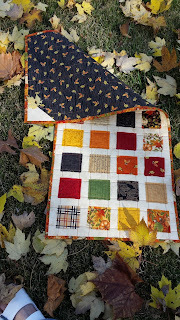 The kit I picked out used Deb Strain's Welcome Fall fabric line by Moda. My LQS didn't have the Candy Packs, only the Charm Pack so I MUST make four to use them up! How do you like my rationale??!! I'll be giving these away as Christmas gifts and/or Thank You gifts. I love the richness of these colors. 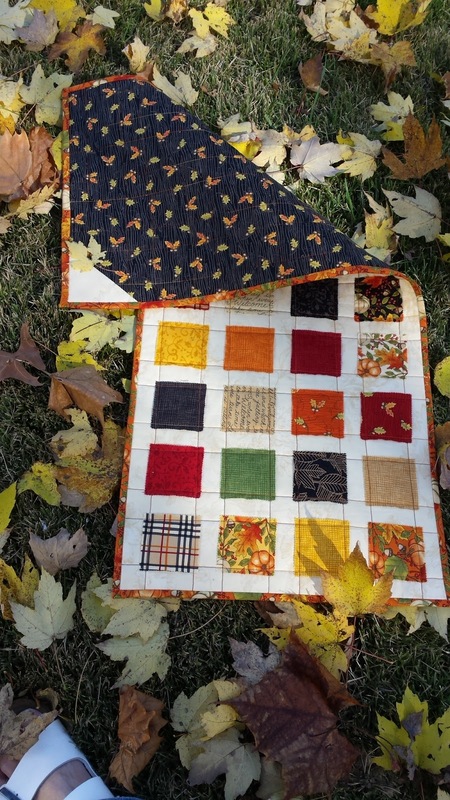 Bought extra yardage too because I'm envisioning a Maple Leaf quilt done with these fabrics! Maybe next year!!! This post has gone on long enough. Time to order my fresh turkey for the holiday and make up a fresh bed! Have a safe holiday, especially if you're traveling! This has been such a wonderful month! I was only able to work on my projects for the last half of the month due to being gone on vacation. Am I complaining? No way! Love vacations but sometimes it does interfere with my "normal" life. Let me start with Loopy Academy. 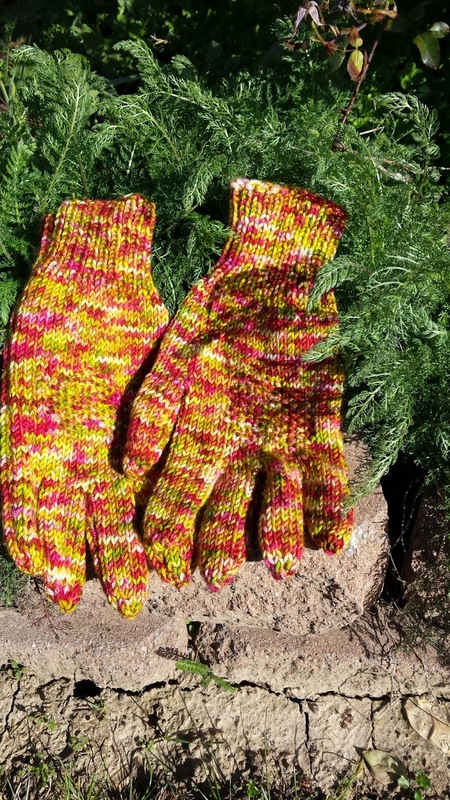 I've completed my gloves and am just about finished with a pair of socks, complete with bobbles or popcorn stitches. I've got them going 2-at-a-time, toe-up for an extra challenge. I've done 2-at-a-time before but they were cuff-down. Glad I tried as I can't think of a reason to ever knit one sock at a time ever again! The sock pattern is a knit-along with www.KnitPurlHunter.com , who is also known as Michelle Hunter! I really like the chains going up the fronts and the stitchery going up the back is unique. Simple patterns yet keeps it interesting. 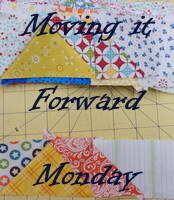 Let me get on with the applique & English paper-piecing class I was fortunate enough to take. 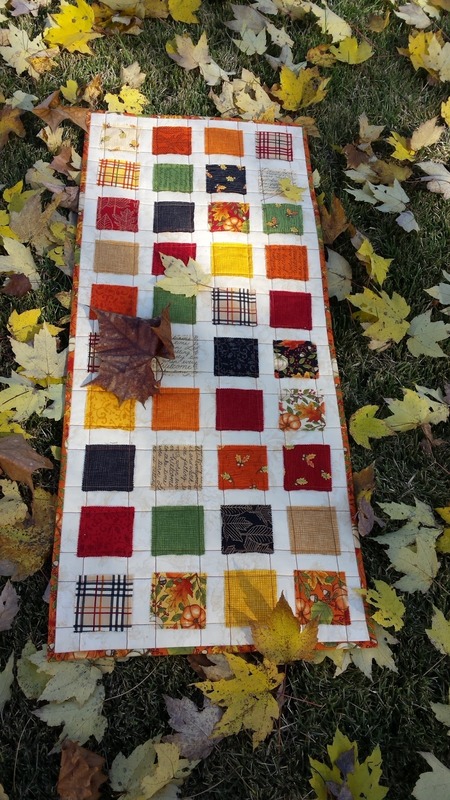 Irene Blanck worked in classes all over the USA coinciding with Quilt Market in Houston. She hails from Australia so that right there tells you what a treat it was to take a class from her. Some of her methods I was familiar with, some I was not. It's so fun to take classes from different teachers because there's usually a bonus tip you can pick up ... or it is just the Aussies? Case in point, I took a wool applique class a while ago. The instructors were Australian and I picked up stapling (yes, you heard me, stapling!) my wool pieces to my background before stitching. Such an eye-opening tip!!! Totally portable!! I think maybe that's key for the stitchers from Australia. Irene was very big into getting things totally glued in place before sewing. She also stressed keeping everything portable! Yesterday I checked & checked the website for the APQ 2016 UFO Challenge. I wasn't the only one either judging by the comments! I went to bed last night and still didn't know what project was chosen. When I woke up this morning, still no post. However, I checked about an hour ago and there it was -- #9. Check out what was in my lap this morning! Yup! Finishing up my September APQ 2016 UFO Challenge! I've actually finished since this picture was taken this morning and I look forward to cooler (even COLD!) temperatures which will be coming eventually! I predict a lot of applique in my future. 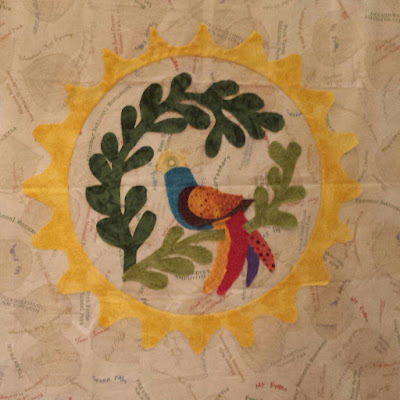 I went to a one-day retreat Friday and I to my applique project! Have a great day! I'm sharing a picture I took on my walk this morning. Loved the cool, crisp air, the warm sun on my back, and the clematis still sharing joy in blooming just for me!